Marriage is more beneficial for men than for women - at least for those who want a long life. Previous studies have shown that men with younger wives live longer. While it had long been assumed that women with younger husbands also live longer, in a new study Sven Drefahl from the Max Planck Institute for Demographic Research (MPIDR) in Rostock, Germany, has shown that this is not the case. Instead, the greater the age difference from the husband, the lower the wife’s life expectancy. This is the case irrespective of whether the woman is younger or older than her spouse. Related to life expectancy choosing a wife is easy for men - the younger the better. The mortality risk of a husband who is seven to nine years older than his wife is reduced by eleven percent compared to couples where both partners are the same age. Conversely, a man dies earlier when he is younger than his spouse. For years, researchers have thought that this data holds true for both sexes. They assumed an effect called "health selection" was in play; those who select younger partners are able to do so because they are healthier and thus already have a higher life expectancy. It was also thought that a younger spouse has a positive psychological and social effect on an older partner and can be a better caretaker in old age, thereby helping to extend the partner’s life. "These theories now have to be reconsidered", says Sven Drefahl from MPIDR. "It appears that the reasons for mortality differences due to the age gap of the spouses remain unclear." Using data from almost two million Danish couples, Drefahl was able to eliminate the statistical shortcomings of earlier research, and showed that the best choice for a woman is to marry a man of exactly the same age; an older husband shortens her life, and a younger one even more so. According to Drefahl’s study, published May 12th in the journal Demography, women marrying a partner seven to nine years younger increase their mortality risk by 20 percent. Hence, "health selection" can’t be true for women; healthy women apparently don’t go chasing after younger men. While many studies on mate selection show that women mostly prefer men the same age, most of them end up with an older husband. In the United States, on average a groom is 2.3 years older than his bride. "It’s not that women couldn’t find younger partners; the majority just don’t want to", says Sven Drefahl. It is also doubtful that older wives benefit psychologically and socially from a younger husband. This effect only seems to work for men. "On average, men have fewer and lesser quality social contacts than those of women," says Sven Drefahl. Thus, unlike the benefits of a younger wife, a younger husband wouldn’t help extend the life of his older wife by taking care of her, going for a walk with her and enjoying late life together. She already has friends for that. The older man, however, doesn’t. 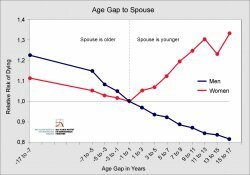 This means that women don’t benefit by having a younger partner, but why does he shorten their lives? "One of the few possible explanations is that couples with younger husbands violate social norms and thus suffer from social sanctions," says Sven Drefahl. Since marrying a younger husband deviates from what is regarded as normal, these couples could be regarded as outsiders and receive less social support. This could result in a less joyful and more stressful life, reduced health, and finally, increased mortality. While the new MPIDR study shows that marriage disadvantages most women when they are not the same age as their husband, it is not true that marriage in general is unfavorable. Being married raises the life expectancy of both men and women above those that are unmarried. Women are also generally better off than men; worldwide their life expectancy exceeds that of men by a few years. CAN A MOTHER'S VOICE SPUR RECOVERY FROM A COMA?